The first minister has pulled the plug on plans to add fluoride to drinking water in Scotland. Jack McConnell told parliament the Scottish Executive was instead planning a range of other measures to improve the dental health of children. Some dentists and the World Health Organisation have backed fluoridisation while other experts have said more research is needed on the issue. The announcement follows a public consultation on the subject. Mr McConnell said: "I wish to confirm, having listened to the views expressed, we will not be changing the current legislation on fluoridation of the water supply in this parliament. "We will however bring forward a range of other measures to improve the dental health of children, especially in their early years. "While we can't go out there and brush people's teeth, we can create a culture in this country where young people take this issue more seriously." Fluoride has been said to help decrease tooth decay and strengthen teeth in young children. However, others believe the substance can have toxic side-effects and prove harmful to dental health. 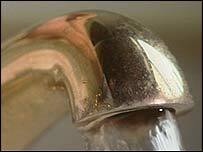 The Medical Research Council (MRC) has recommended further research on the effects of adding the chemical to drinking water. A study found no firm evidence to back claims of a link between water fluoridation and cancer but the council has called for new studies on the causes of bone cancer to include an assessment of exposure to fluoride. 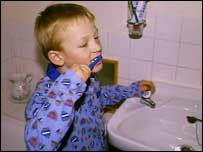 Other research has found water fluoridation does help prevent dental cavities but warned of a link with dental fluorosis, a condition which discolours the teeth. Green MSP Patrick Harvie was pleased with the decision to abandon the plans to include water fluoridation in the forthcoming Health Service (Miscellaneous Provisions) Bill. He called on Mr McConnell definitively to rule out water fluoridation from all other legislation. He said: "I welcome the announcement that the new bill won't include fluoridation but we need to hear a clear commitment that this won't come back again in a year or two's time. "The forthcoming bill is a real opportunity to control the over-use of refined sugar - that's the real cause of poor oral health and the real solution must address this directly."